The Sempione is perfect for those tourists arriving at the station which is also the main air terminal for Linate, Malpensa and Bergamo Orio al Serio. The Sempione has Wi-Fi in the hotel public areas but regrettably not in the guest rooms. Room Service is on hand 18 hours a day and all guestrooms are equipped with en suite bathrooms. Milanese 3 star hotel accommodation at excellent rates use the online reservation system to book your cheap or budget accommodation in Milano in real-time, book now but don’t pay until check out! 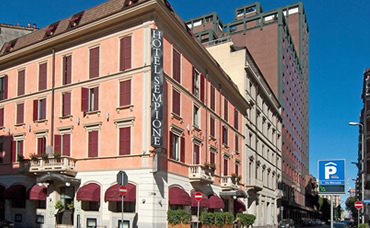 For the ideal weekend city break at great rates why not book a room at the Hotel Sempione in Milan. Boasting a fantastic city centre position the Sempione a noted 3 star hotel, family run and recently renovated is great value for money particularly at weekends when there is no big international fair or exhibition on. Guests who require special facilities or a room on the ground floor due to mobility problems should make any special requests via our Real Time Online Booking System. This ultra-secure system also allows you to check the availability of rooms in real time as well as regularly offering special deals to clients who book online directly with the hotel. Only 50 metres from the Milan Metro Stop Repubblica! La Repubblica restaurant so called thanks to our location only 50 metres from the Milan Metro Stop Repubblica. Our hotel restaurant is popular with both Milanese and Tourists alike. Breakfast is served between the hours of 7 and 10 am – a complimentary selection of Italian croissants, cereals and hams and cheeses. Italian coffee i.e. either cappuccino or café latte to start you on your way. Later in the day, the hotel bar is at your disposal as is our hotel lobby.